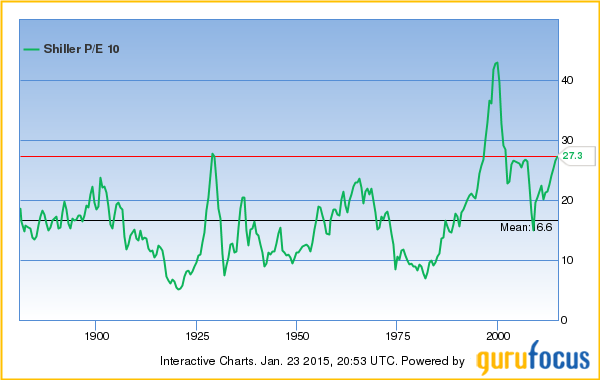 Last week in the Ahead of the Curve section of Economy & Markets, John Del Vecchio wrote about how the U.S. stock market was expensive by historical norms, using one of his favorite metrics, the price/sales ratio. A price/sales ratio above 1.26 signals danger and at 1.71 we are well above those levels today. At ratios over 1.26, stocks are priced to deliver returns of about 0.70% per year based on past experience. Today, I’d like to expand on John’s points using one of my favorite metrics, the cyclically-adjusted price/earnings ratio (CAPE). The CAPE takes the current market price and divides it by an average of the past 10 years of earnings, adjusted for inflation. By taking a 10-year average, you smooth out the booms and busts of the economic cycle. It’s counterintuitive, but stocks can sometimes look cheap at the top of the economic cycle using the traditional price/earnings ratio when they’re actually very expensive. The CAPE smooths out this noise and gives better perspective. For the history buffs out there, Benjamin Graham, the father of the investment profession as we know it today and mentor to a young Warren Buffett, used the CAPE extensively and wrote about it in his classic Security Analysis. So, what does the CAPE tell us? Well, at a CAPE of 27.3, stocks today are more expensive than they were in 2008 and about on par with their valuation in 1929. The only time in history when stocks were more expensive was the go-go bubble years of the 1990s. Let’s play with the numbers a little. At these levels, the S&P 500 CAPE is 64.5% more expensive than its long-term average. This implies that we’ll see annual returns of about 0.3% per year over the next eight years. This needs a little explaining. There are three components that go into the calculation: the dividend yield, expansion or contraction of the CAPE to its long-term average and underlying business growth. The weakest link here is business growth. The assumptions made by GuruFocus here assume that business growth is in line with past averages, and that’s an assumption I’d rather not make right now given the debt, deflation and demographic issues facing the world’s major economies. Revising business growth lower would push expected returns even lower. But for our purposes here, we’ll roll with it. Let’s look at some scenarios. For the sake of argument, let’s say that this time it really is different and that because today bond yields are so abnormally low, they keep stock valuations artificially high. If we get lucky, and CAPE valuations don’t revert to their means, we might manage to squeak out between 2.9% to 5.2% annual returns over the next eight years, including roughly 1.9% in dividends. But given that markets tend to overshoot, swinging from overvalued to undervalued, I think it’s more likely we’ll see the negative returns you see in the table. In John’s piece, he noted that, unlike the 1990s, when you could actually find value outside of bubbly tech stocks, “everything” is overvalued here. And I agree. I’d add that by one metric the market is even more overvalued today than it was in 1999. The data John and I used covered the large stocks of the S&P 500, which is dominated by a small handful of mega-cap names. But Dartmouth professor Kenneth French recently found that the median stock—that “average” stock in the middle—is actually trading at the highest price/earnings ratio since World War II. The easy money was made a long time ago. If you’re investing new funds in equities right now, you’re betting that already expensive stocks will get even more so. Frankly, I’m not so sure that’s a bet I’d want to make.